​We call ourselves the Free Campers because we just love to be on our travels, exploring the back roads of North America spending as little money as possible while in pursuit of the best free camping locations in America. We live in Nova Scotia, Canada, but we spend half our lives away from our home. ​We are probably what would be described as typical baby boomer snowbirds who love to travel and to spend as much time as we can in the the great outdoors. Needless to say, we avoid the cold Canadian winters at all costs. Having traveled to numerous International destinations, we decided that it was time to put our love of camping to the top of our to-do list. Most of our destinations relate to living off-grid, using our solar panels for power and our fairly large water tanks to keep us going. We always travel on a budget, so it has become a hobby to see how little we can spend on our limited retirement income. 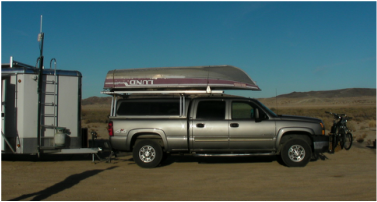 ​When Dieter retired, we decided to purchase an RV that would take us to anywhere in North America. Sadly, from our observations of the units that were out there, none of them really matched our ideals, so Dieter decided he could take on the building of our own self-sufficient trailer that could be used out in the boondocks for long periods of time. With a background in computer software (training and support), Sue naturally became the computerized planner of our trips (and the creator of this site). We travel with as much technology as we need, including two GPS units, a smarthone, a laptop and two tablets. 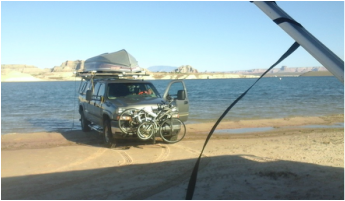 From the information we can get from the ever increasing number of websites related to our interests in boondocking and camping, we have been able to find some really cool (and free) boondocking spots around America. We plan to spend the next few years exploring new locations and returning to some that we loved and want to return to. Join us as we share our experiences and knowledge with other like-minded travelers who can appreciate what we want out of our retired lives. Oh yes! I have to mention that we travel with two cats, Charlie and Camilla. Camilla was the first to arrive, so when we decided to bring in Charlie to be her companion, we despaired that this was not going to work because Camilla growled for 2 days running every time Charlie came anywhere near her. Miraculously, after two days of hell, Camilla did an about-turn from hating his presence to being completely in love with him. She has become the caring nurturing mother and he clearly loves the attention she gives him. The boat and bicycles go everywhere with us.